My vision of a goddess. Sombre and vibrant together, wonderful! Simply gorgeous. No other words for it, really. I am printing this out and hanging it above my Wiccan altar. I shall link you pics. OHMYGODDESS!!! this is utterly amazing! i love this sooooo much! great work, I personally believe in Goddesses, and this is a great representation of One!!! I love the colors, very beautiful. no words.wow.THIS IS TOTALLY AWESOME!!!!!!!!!!!!!!!!!!!!!!!!!!!!! It's impossible to describe this with words. Just pure epicness. This is wonderful and very inspirational, i do hope you continue with a style like this and create many works as beautiful as this one., i can say no more than that. I love this & I love you for it. In a very non vain way this perfectly captures how I feel when I hoop dance and i'm always wearing a flower in my hair. Thank you for this. I appreciate your appreciation. Thank you so much! I really appreciate your appreciation. Thank you so much! I LOVE her hair, how it cascades. Beautiful. 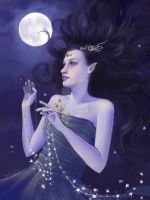 As a Wiccan, this is exactly how I imagine The Goddess. Your picture is absolutely beautiful. Thank you so much! Brightest Blessings too! Very beautiful! I love all the intricate things going on in her hair and then the clean precision and softness of her face. thank you! you are very much welcome. That hair is amazing. Great illustration! I adore how you make hair. It's my favorite part to draw, hair. haha. thank you!